Hard Disk Sentinel is designed to start automatically with the system and run in the background, to monitor hard disk information (temperature, health, performance, etc.) and report any kind of problems as early as possible. check the text description and health values reported for your hard disks / SSDs and follow if Hard Disk Sentinel reports problems/recommendations, especially if it recommends backup. use test methods in Disk menu to reveal and fix possible problems. Let's see these with more details! 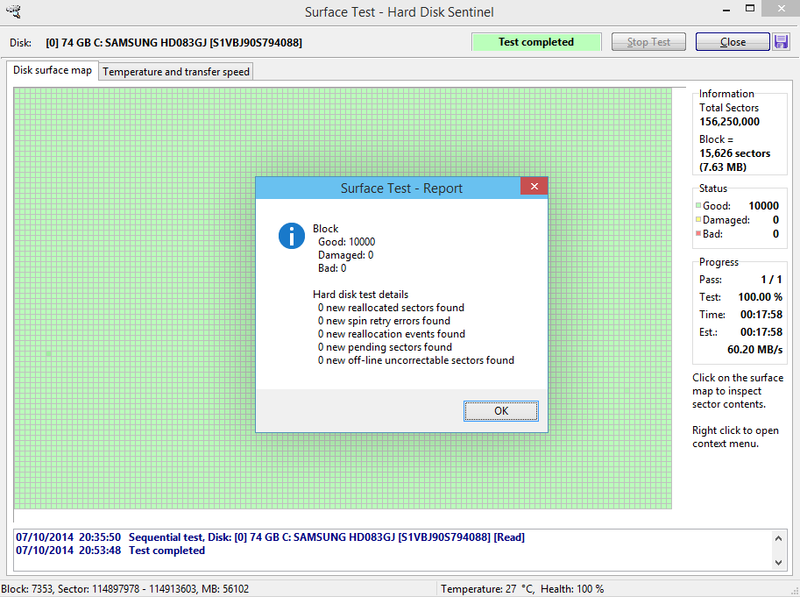 In its main window, Hard Disk Sentinel gives an immediate description about the problem(s) found and the Health bar shows the overall health level (0-100 %) of the hard disk/SSD, based on the detected problems. For solid state disks (SSD), if no problem reported, the health may indicate the generic wearout of memory cells. 0 % means that the error-threshold reached when the hard disk is about to fail, data corruption / data loss may happen any time. In such situations, warranty replacement should be asked (if applicable) as the hard disk is considered "bad". Usually new operating system installation is not possible on such hard disks. 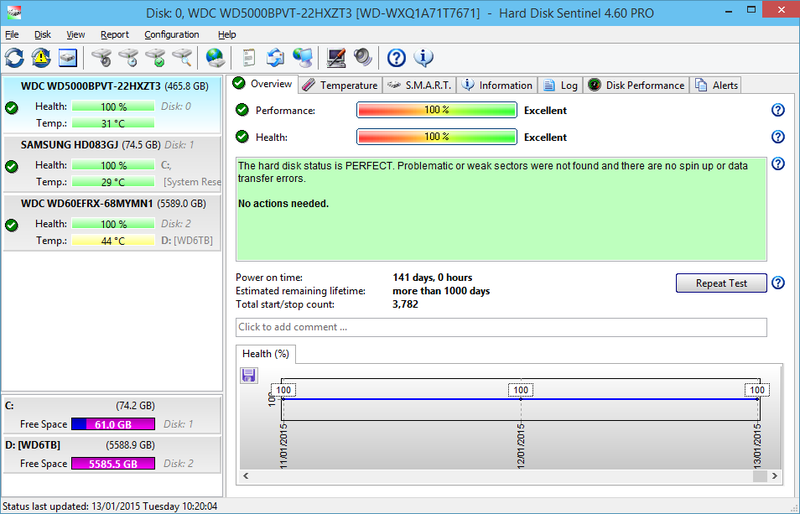 Hard Disk Sentinel shows both the current health, temperature, performance and generic lifetime statistics immediately. Also shows a text description indicating the amount of problems found with the hard disk/SSD and/or the storage system in general (for example it may describe issues found with faulty data cables, connections or problems related to power source). There generic tips, recommendations are also displayed especially if the problem requires immediate action: perform backup, replacement or stop using the current configuration to prevent data loss. Generally the Hard Disk Cases pages describe very common situations (bad sectors, weak sectors, communication problems, spin up problems, etc. ), how to fix issues by Hard Disk Sentinel - and avoid, improve the situation in general. When new problems found with the hard disk drive, the health value starts to decrease and the graph on the bottom shows how it changes with time (shows the lowest health measured for all days since Hard Disk Sentinel first recognised the hard disk/SSD). If the health drops below a certain limit (can be adjusted in Configuration -> Thresholds / tray icon page), the tray icon starts blinking, giving a visual alert for the problem. From the Disk menu, it is possible to adjust hard-disk specific features and perform different kind of hard disk tests. The hard disk tests in Hard Disk Sentinel are the best way to reveal and fix any kind of hard disk errors, diagnose hard disks / SSDs - or confirm if the status is stable and perfect. This is always recommended to do after installation and especially when installing/using a new (or used) hard disk, just like as an antivirus software would perform a complete scan, to verify the system. For more information about such tests, please check: Hard disk health is low or recently changed or I just installed a new (used) hard disk. How can I perform a deep analysis? and How to repair hard disk drive? How to eliminate displayed hard disk problems? Note that most tests are available only in the registered version of Hard Disk Sentinel Professional version only. By the registered version of the software, it is possible to define different alarms for different situations. For example, Hard Disk Sentinel can display warning or notify by e-mail if a new problem is found, play sound alert if the temperature is too high, if free space of any hard disk is too low and so. Please check the Configuration -> Alerts for the list of available alerts. In Hard Disk Sentinel Professional it is possible to configure backup projects (for example saving all documents to an external storage) and enable these projects to run automatically upon any event and you can set any projects to run in a scheduled way. Press F1 anytime to open on-line help which automatically displays information for the currently selected item or page. You can use the "?" icons in the main window also to get information about a displayed item. Also you may use Report menu -> Send test report to developer option any time, as then it is possible to check the actual situation and advise.